Digital message recorder with 5W RMS output power for recording up to 2 messages with a combined maximum time of 120 seconds. You can repeatedly store and play any sounds, conversation, etc., as required. The module can be configured to provide 1 message of up to 120 seconds or to share the total time in 2 messages of up to 60 seconds each. Once recorded, the messages are stored in non-volatile memory so remain even if you disconnect the power supply. Messages can be played once or in a repetitive loop (with message input held closed). A message will be played in full regardless of the status of other inputs during playback. All input buttons must be released before playback of another message can be initiated. It includes an on-board microphone with optional automatic gain control, RCA audio input (for upload from computer, etc.) and indication LEDs. Output power 5 Watts RMS at 4 Ohms, (7.2 W . musical) with volume control. 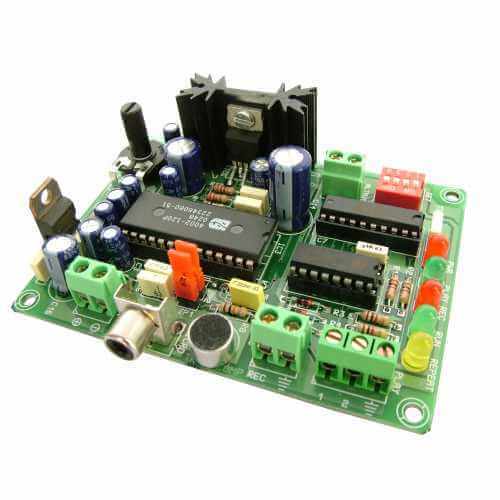 The board needs a 12Vdc supply and is reverse polarity protected. Screw terminal blocks for all connections.